Modern.Incredible Community. Unquestionably inspiring in a myriad of ways describes this idyllic private elevator Townhome in the gated community of The Cove at Loggerhead to a T. Residents experience almost 2000 sq ft of causal elegance and this home is nestled against the 6 acre nature preserve that is part of the community. Boasting a massive master suite, a chefs kitchen with a diverse range of high end appliances, two additional bedrooms, 2 1/2 baths, a music room, an unbelievable amount of selectively chosen upgrades and an oversized tandem garage are just waiting for you to call it home. 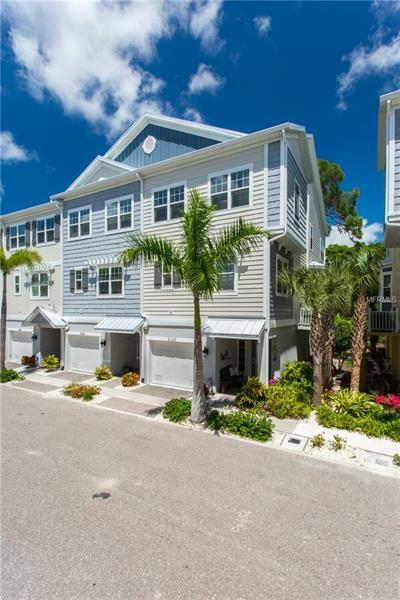 The marina, pool and clubhouse are just foot steps away and the neighborhood is known for the casual seafare living. This end unit home was hand picked by the sellers for its secluded and private location. Surrounded by nature the cocktail terrace on the 2nd level beckons you to join in the serenity that abounds. You are able to have your vessel in either wet or dry storage. St Petersburg has a style, rhythm and culture all its own with the beaches and downtown just 9 minutes away. All of this enticeâs you to live in Paradise.